There is a lot of research being undertaken into the criminal psychopath's mind in the hope that useful treatments can be found to reduce the anti-social aspects of this personality disorder. Although psychopaths can't be cured, the underlying causes can be identified and treated - especially if identified at a young enough age - to help moderate behaviour. The most controversial aspect of these studies is the legal minefield it opens up: if a child has some trauma - psychical or mental abuse - that causes his brain to develop abnormally, does that represent mitigation for heinous crimes committed in adult life? Through the administration of large doses of Omega 3, paediatric specialists have noted a 35% improvement in activity in the areas of the brain associated with psychopathy in children suspected of developing this personality disorder. This treatment has significant implications for the future, but is still very much in its infancy. 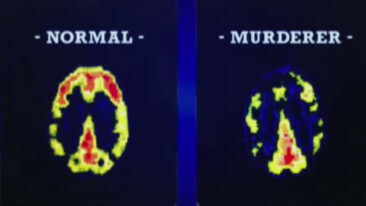 This image shows a brain scan from a normal person compared with Joel Rifkin, a psychopath who murdered and then dismembered seventeen women. The frontal cortex, where, in simplistic terms, 'the conscience resides', demonstrates far less activity than in a normal person. For more on this, you'll find a brief video clip (8 mins) the image was taken from here.